During our stay in Osaka, we went on a two-day trip to Koya-san, a Buddhist temple complex in the Kii Peninsula. It’s nr 7 of the top 25 places to visit in Lonely Planet’s guide-book and I wasn’t disappointed. Even the travel from Osaka was very pleasant and a bit of an adventure in itself. First, we hopped on a train on the Nankai Line from Namba in Osaka. To my great surprise, we discovered that the train tickets were pretty much exclusively written in kanji (Chinese characters) and I’ve only learned the kanji for 1,2 and 3 (which is pretty easy since it’s only 1, 2 and 3 horizontal lines). I felt a bit distressed about not knowing when and where we should leave the train so I asked the obāsan sitting next to me for some help. She must have had some kind of dialect because I had more trouble understanding her than I usually do. However, she didn’t let a minor detail like that discourage her. Since she wasn’t going to Koya-san herself, she couldn’t guide us herself. Instead she found a lovely couple that was going the same way and asked them to take us. It turned out that in the middle of the train ride, we had to switch trains. If not for the help of the nice lady, we could have missed the second train. Why can’t I have this view from my bus stop at home? 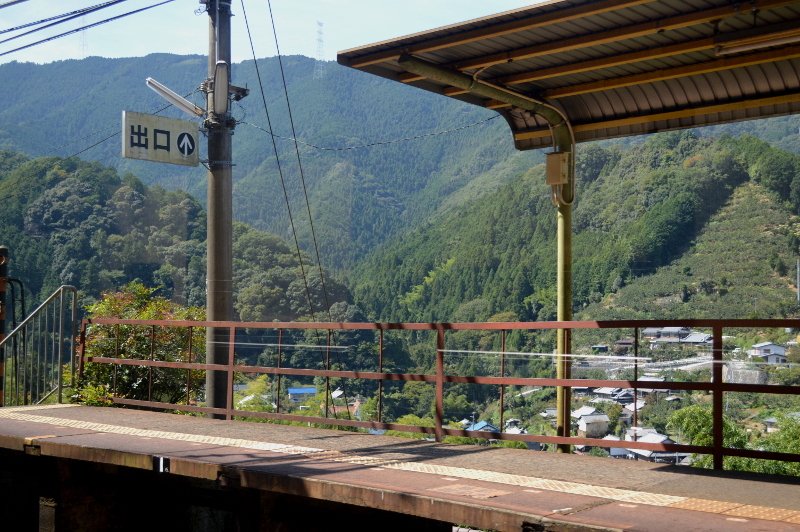 After we switched trains, the tracks started going up in the mountains along the steep mountain sides and it felt a bit like being back in Hakone. The view from the train was amazing and the nice weather just enhanced the whole experience. 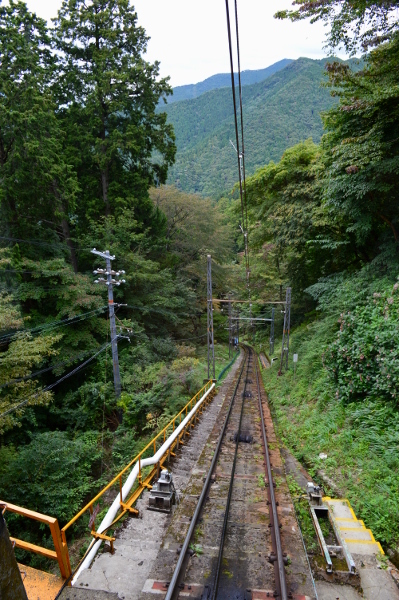 At the train end station, a cable car was waiting to take the visitors up the steep hill. After the cable car ride, there were buses waiting to take the visitors on the winding road that leads to central Koya-san. In the cable car, looking down on the track where we came from. 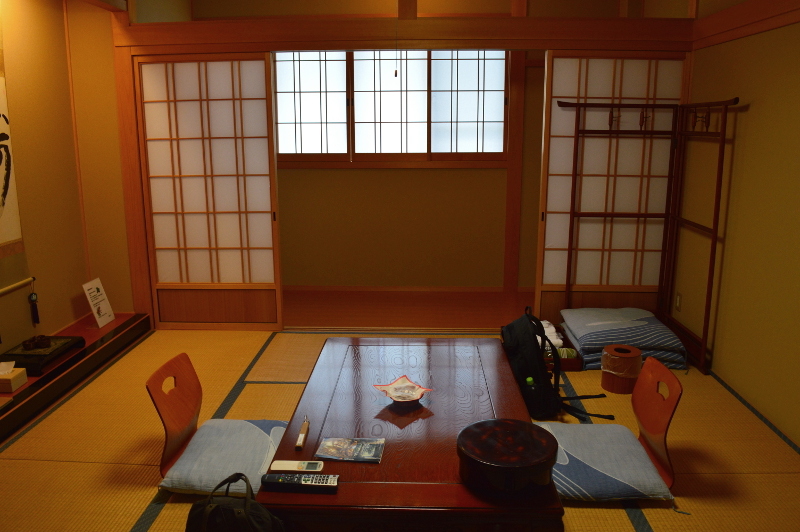 This was our room at Fudou-in. Before it was time for dinner, we went out to have a look at the town and all its temples. An interesting detail is that everything is owned by the temples. And when I say everything, I mean everything. Even the restaurants and fire department is owned by the temple! And they don’t stop at the fire department, I reckon each respectable Buddhist temple town should have at least one giant pagoda and Koya-san didn’t disappoint. Just look at that huge building! The people look like ants in comparison. Out of all the temples to choose from, I liked the Kongobuji temple the most. The rock garden was amazing and in a way it reminded me of the ocean with the rocks looking like small islands. If you’re going to visit one temple here, make sure this is the one! While the temples are nice, the main reason why people travel to Koya-san is to visit the vast graveyard called Oku-no-in. The main path is lit up by lanterns and it leads the visitors through a place where ancient cedar trees and tombstones compete for space. At the northern end, there’s a building called the lantern hall. It’s filled to the brim with thousands of lanterns that’s been donated by worshippers. A stone’s throw away from the lantern hall are the Jizo pyramids. Perhaps you’re wondering about the red bibs? I was too, but an acquaintance explained that the bibs are placed on the statues to ensure Jizo’s protection of dead children. After spending the night, we woke up early to attend the morning ceremony at the temple. It was very interesting but to be honest, I found it a bit repetitive. Strangely enough, the hour practically flew by and the ceremony was finished with one of the monks telling us a little bit about Koysa-san and how it was founded in 819 by the monk named Kūkai (also known as Kōbō-Daishi). After the brief history lesson, we headed off to the dining room where breakfast was already waiting. Just like the dinner, the breakfast was vegetarian and absolutely delicious! 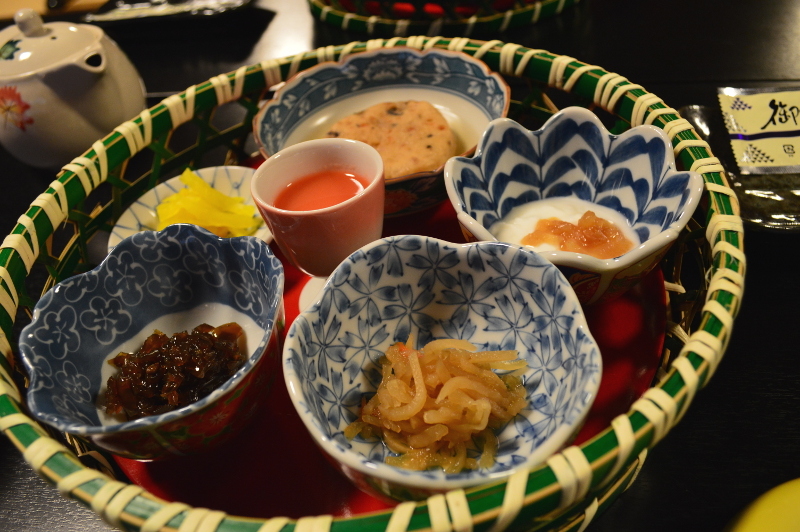 I sometimes feel that I hesitate to eat some dishes in a kaiseki dinner/breakfast because sometimes they tend to serve stuff that is a bit too exotic for my taste. Take snails for instance, that’s a little bit too out there for me. But when it’s all vegetables I really don’t have to think about what I’m eating. In a way, it’s easier to enjoy the food. Since a typhoon was supposed to move in during the evening we decided to go for a stroll before taking the train back at around 11-12. First we went to the museum which was a bit so-so since they didn’t have much information in English. They had some really beautiful statues, paintings etc. on display but I would’ve liked to know more about them. Leaving the museum, we headed for the huge gate to the east that used to be the main access road back in the day. Just a stone’s throw away was a small path lined with torii gates that looked very inviting. What better end to the trip than a nice mountain hike? After a mere 200m or so, we found a sign warning us about bears. We decided that meeting a black bear wasn’t a nice way of ending the trip and then we bravely advanced in another direction. Is it a green hedgehog or a japanese chestnut? Categories: Japan, Travels | Tags: Japan, Koya-san, Oku-no-in, Osaka | Permalink.